In January of 1793, King Louis XVI of France literally lost his head, ushering in what history would call the “Reign of Terror.” The French Revolution, though founded on the lofty principles of the American model, descended into the chaos and bloody wars of the Napoleonic Era. Across the Atlantic, however, the United States—with its revolutionary struggles long past—was now busy getting down to business. Promoting business and trade was high on Congress’ agenda, and establishing a sovereign coinage system was one of its earliest acts. The Coinage Act of April 2, 1792 authorized the Mint and prescribed the standards for the new federal decimal coinage. The smallest denomination provided for in the law was the copper half cent, first struck in July 1793, just four months after the Chain cent appeared. Equal to 1/200th of a dollar, the half cent had more spending power than many modern Americans realize. A dollar in 1793 was a respectable amount of money, although no U. S. dollar coins would be struck for another year. Instead, the new copper cents and half cents would be fractions of the Spanish milled dollar or Piece of Eight, the hefty silver coin struck in both Spanish and Latin American mints. Widely used throughout the Western Hemisphere, the Spanish coins were very familiar to Americans and served as the basis for the U.S. silver dollar coin issued in 1794. Since the Spanish fractional one real or bit was equal to 12-1/2 cents in decimal coinage, a half cent was necessary for making honest change. Few Americans living away from the Atlantic seaboard, however, actually handled many of these “Little Half Sisters,” as copper coinage student Dr. Warren A. Lapp nicknamed the denomination. Although half cents were issued for more than 60 years, they remained America’s unwanted coins. They proved to be of little use, circulated grudgingly if at all, and were often kept in dead storage at the Mint waiting for infrequent orders from the infant nation’s banks. Production—sometimes for several years—was often interrupted by shortages of copper and lack of demand. This small denomination may have suffered from identification with the poorest classes; they were supposed to be its biggest users, at least according to Robert Morris, the Revolutionary War financier and one of the architects of the U. S. coinage system. Morris subscribed to the age-old but misguided view that smaller denominations brought lower prices, allowing the poor to purchase more with their money. Unfortunately, not only did the public have little use for half cents, but for generations collectors also ignored the little copper coins. Only recently has a birth of interest been sparked, with the publication of new definitive works in the mid- 1980s: American Half Cents, the “Little Half Sisters” by Roger Cohen and Walter Breen’s Encyclopedia of United States Half Cents have attracted many new devotees to this long overlooked denomination. The first United States Mint Director, the eminent but aging scientist David Rittenhouse, was inspired in his choice of the first half cent obverse by French medalist Augustin Dupre’s Libertas Americana Medal of 1783. This bold example of medallic propaganda was struck in Paris under the auspices of American envoy Benjamin Franklin, who sought to publicize American Liberty and the Continental Army victories at Saratoga and Yorktown. Dupre depicted the spirit of Liberty as a young woman with streaming locks of hair flowing in the wind of freedom. Behind her head he placed a pole supporting the pileus or ancient cap of liberty. Franklin felt this medal would help to enhance American-French goodwill, and to some extent it did. Numismatic researchers believe that coiner Adam Eckfeldt cut the dies for the new half cent, assisted by engravers Joseph Wright and Robert Birch. Eckfeldt was an expert machinist and talented “jack of all trades” whose ability to improvise kept the Mint alive despite critical shortages of copper, die steel and skilled craftsmen. Production began in late July and continued into September 1793. The Mint was then closed, and the staff fled the annual yellow fever epidemic, which in that year claimed the life of the newly-hired Wright. The design depicts an idealized head of Liberty facing left, with a large, floppy Phrygian cap on a pole in the background. This was the soft cap worn by freed Roman slaves. It celebrated newly achieved freedom and hid the close-cropped haircut that identified slaves, even as a striped uniform would one day identify escaping convicts. The inscription LIBERTY appears above the bust, the date 1793 below. The reverse, which Eckfeldt fashioned from sketches provided by Rittenhouse, features a laurel wreath of leaves and berries tied with a bow. UNITED STATES OF AMERICA and the fraction 1/200 surround the wreath, which encloses HALF CENT. A beaded border encircles the periphery on both sides of the coin, and the edges bear the incuse inscription TWO HUNDRED FOR A DOLLAR followed by two leaves. 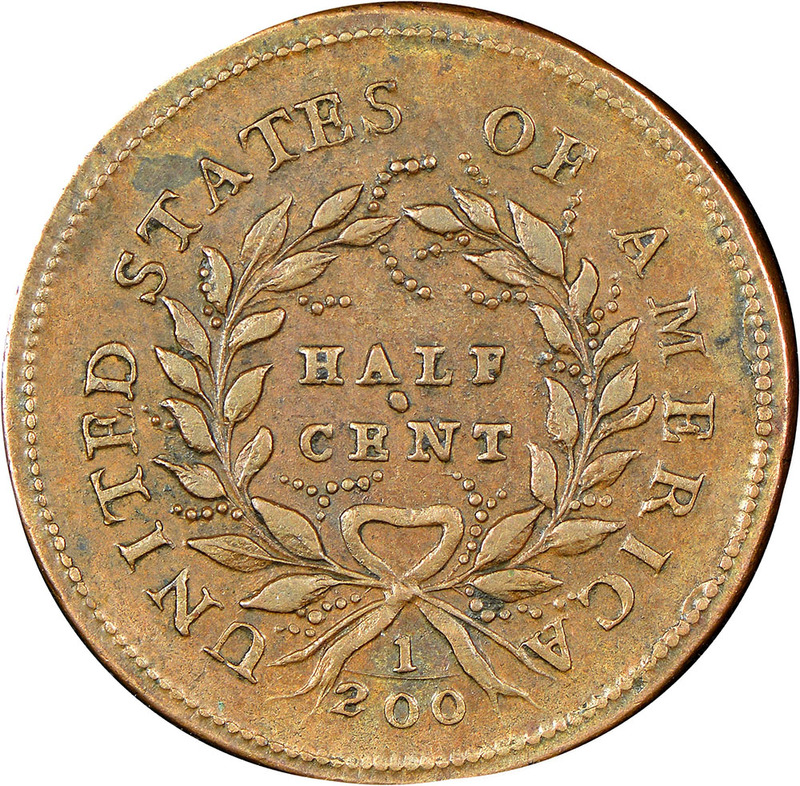 This single issue has four major varieties based on the size and location of the fraction, period after AMERICA and the presence and size of a center dot between HALF and CENT. During its first year, the fledgling United States Mint managed to find enough metal to strike 35,334 of the new half cents. Only about 550 specimens exist today, the majority in the lower circulated grades, with Very Fine to About Uncirculated examples only occasionally available. About 20 survivors are in Mint State, some showing evidence of being made with particular care, most likely as souvenir examples destined for VIPs. The 1793 half cent is eagerly sought by collectors, as this issue is not only the first year of the denomination but also a one-year type coin. Wear first shows on this design on the hair above Liberty’s brow and behind her ear and also on her shoulder. On the reverse, check the leaves above the H in HALF. Coining the cents and half cents of this date kept the new Mint staff busy and gaining in skill until all personnel connected with silver or gold coinage could post the high bonds required by Congress. President Washington ultimately agreed to Rittenhouse’s request that the bonds be lowered to a more reasonable figure, but meanwhile the coppers kept the machinery in motion. Without the copper coinage, which was neither legal tender nor of precious metal, the Mint’s already rough road would have been far rougher. After Joseph Wright’s death, Rittenhouse hired Robert Scot as Chief Engraver. A watchmaker and banknote engraver of some repute, Scot’s talents as a die-cutter proved to be marginal at best. 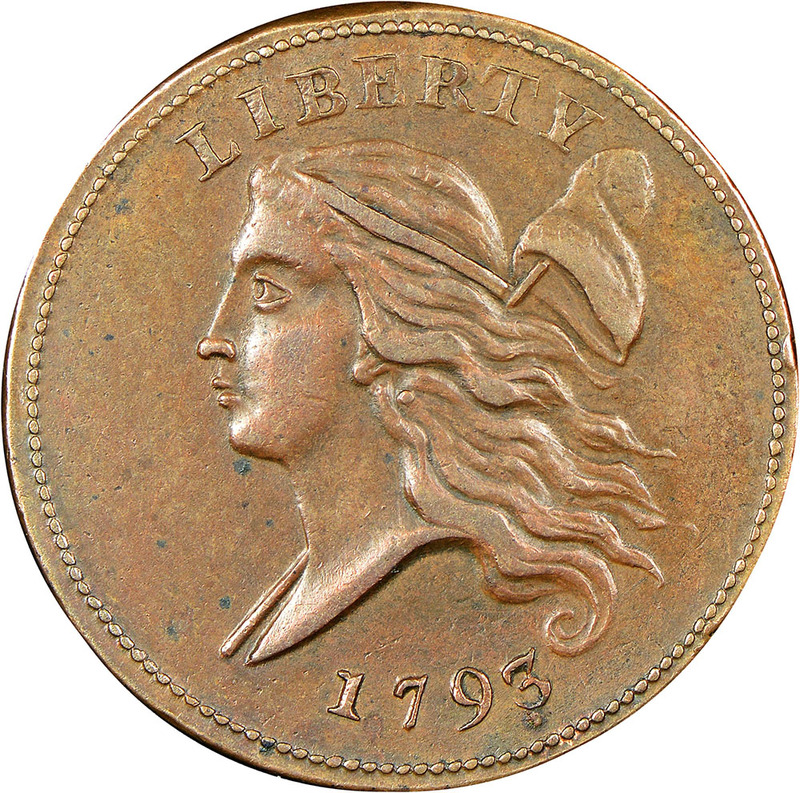 In 1794, Scot modified the half cent design, enlarging Liberty’s head and cap and facing the head to the right. This Liberty Cap design, with several modifications, was issued through 1797. In August of 1794, at the battle of Fallen Timbers in Ohio, the English were finally driven from the western forts they had maintained since the Revolution. Although America’s struggle with the British Empire had ended, revolutionary France was still embroiled in external wars and internal chaos. While French soldiers streamed into the Low Countries, the Reign of Terror raged, and some 40,000 royalists were executed, many by guillotine. Just as France had been a staunch supporter of America in its struggle for independence, American interest in the French Revolution had initially been highly sympathetic. But the primary difference between foreign support for each country’s revolution was that France had a great deal to gain by helping America wrest its freedom from its arch rival, England. America, on the other hand, had virtually nothing to gain by supporting the French armies in their war against Great Britain. In fact, it had a great deal to lose: Customs duties and other taxes levied on British imports amounted to roughly 80% of the money used to operate the federal government in the 1790s. With America’s focus shifting from revolution to nation building, its alliance with France was further strained by that nation’s continuing societal violence, which frightened and horrified many on this side of the Atlantic. Against this background of deteriorating American sentiment toward France, it was ironic that the central design of a French medal was used to represent the concept of Liberty for the U.S. half cent. The Libertas Americana medal that inspired the 1793 half cent was designed by French medalist Augustin Dupre as a celebration of American victories in the Revolutionary War. Intricately detailed and highly expressive, the medal made an excellent model for a coin. But the original adaptation of the design lasted only one year. In 1794, Chief Engraver Robert Scot modified the design by enlarging the bust of Liberty and having her face right rather than left. He also greatly increased the size of the Phrygian cap set on top of Liberty’s pole. An innovative mechanical experiment was tried with the reverse. Rather than using individual device punches to make up the die, Scot created a complete reverse hub that included the wreath, all lettering, and dentils around the border. The wreath was similar to the one from the previous year but without the sprays of-berries. The entire design was prepared in higher relief than the half cents of subsequent years. Actually, the half cents of 1794 represent a distinct type, quite different from the half cents of 1795-97 but traditionally included with the later years. The dies for the half cents of 1795 through 1797 were cut by Assistant Engraver John Smith Gardner, who lowered the relief, reduced the size of Liberty and hand-punched the wreath elements. While the series has only two major design types, it includes numerous varieties. Among these is the so-called “punctuated” date of 1795, created by a slip of an engraver’s tool, which resulted in the date reading 1,795. Varieties with the pole missing in front of the bust of Liberty exist for both 1795 and 1796, in both cases an unintentional flaw, but caused in 1795 by excessive lapping of the die and in the following year by the die sinker apparently forgetting to punch in the device. Some half cents from 1795 and 1797 were struck from cut-down Talbot, Allum & Lee tokens, necessitated by the Philadelphia Mint’s frequent shortages of copper planchet stock during the 1790s. Occasionally, remnants of the host token can be seen with traces of the ship’s sails or the peripheral lettering apparent on the finished half cent. Plain edge and lettered edge varieties are known for 1797. Lettered edge examples are very rare and seldom seen above Fine condition. One of the most prominent varieties in the series is from 1797 and shows a numeral 1 directly above the 1 in the date. This error was created when the numeral was first punched into the die much too high and close to the bottom of the bust. Rather than effacing the error by polishing the die, the date was simply punched in the working die in the correct position with the first, higher-positioned numeral remaining clearly evident on the struck coins. During the four years Liberty Cap half cents were struck, a total of 359,529 pieces were produced. No true proofs are known. As with all early coppers, planchet quality varied greatly, and there is considerable variation in striking characteristics from one year to the next. The coins from 1794 are invariably deep brown or black in color, while those from 1795 are usually light brown. Half cents of 1796 are once again dark brown or even black, and many exhibit porosity and planchet flaws. Planchet quality for 1797 is above average for the series, most likely because of the large number of coins struck from Talbot, Allum & Lee tokens, which had been manufactured from high quality, English copper blanks. Grading this design can be somewhat of a challenge because of the variation in planchet and striking quality from year to year. On high grade pieces, wear begins to show on the obverse at the forehead, above the ear and on the highest point of the shoulder. Friction on the reverse is first seen on the leaves beside the H in HALF, on the bow knot and the on ribbon ends. Liberty Cap half cents possess undeniable appeal for both novice and advanced numismatists and enjoy strong demand from date, die variety and type collectors. Although half cents have always seemed to have second class status in relation to large cents, both as a circulating medium and among collectors, die variety collecting of this denomination has gained many new adherents as more research is published. Cohen’s 1982 American Half Cents and Breen’s 1983 Encyclopedia of United States Half Cents have added much to the body of information available today. Ron Manley's reference The Half Cent Die State Book is the most useful tool for attributing half cents to Cohen varieties. The Liberty Cap half cent was last struck in 1797 when production of the denomination was suspended. The half cent would not appear again until 1800, this time with Scot’s adaptation of Gilbert Stuart’s Draped Bust design.